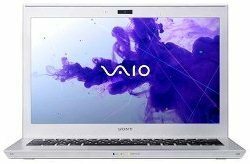 When Sony recently announced its first Ultrabooks, the Vaio T13 and Vaio T11, details for only the 13-inch model were provided, with no mention of pricing or Ivy Bridge processor availability for either model. Now German websites, including Sony’s official German site, fills in those blanks. The Vaio T13 and T11 are both now available for advance order and configuration at Sony.de. The main difference between these two laptops is the display size: The T13 has a 13.3-inch screen while the T11’s screen is 11.6 inches. Both are glossy displays with 1366-by-768-pixel resolution. Apart from size, the models now available for pre-order sport nearly identical configuration options, including a second-generation Intel Core i3-2367M processor (the T13 will also later be upgradable to up to a Core i7 processor according to the specs page) and 4GB to 8GB of memory. The two Ultrabooks offer quite a few storage options as well. The base configuration features a hybrid 320GB drive (320GB HDD plus 32GB SSD), but you can instead outfit either model with a larger 540GB hybrid drive, 128GB SSD, 256GB SSD, or 512GB SSD. Pricing for the T11 starts at approximately US$881 and the T13, US$1044. These prices are comparable to other Ultrabooks -- Asus’s 11.6-inch Zenbook UX21E and UX31E (with Core i5 processors) are listed at $999 and $1099 respectively. However, when the Vaio T Ultrabooks arrive stateside, they may very well be priced more competitively (especially with other Ultrabooks dropping to as low as $599 in the second half of 2012). Intel’s new third-generation Ivy Bridge processors will also be coming to the Vaio T11 and T13, as this hands-on video from TechFokus reveals. Since Ivy Bridge processors won’t be available for Ultrabooks until June, we can’t expect these Sony Ultrabook models with Ivy Bridge until then. The wait should be worth it, though. Besides the significant graphics boost, Ivy Bridge boosts battery life by 20 percent, according to Intel, and Sony has already rated the Vaio T Ultrabooks’ battery life at an impressive nine hours.